About Brownman – Heralded as “Canada’s preeminent jazz trumpet player” by New York City’s Village Voice magazine, winner of 2 National Jazz Awards, 4 Independent Music Awards, a CBC Galaxie “Rising Star” Award and named “one of the top 10 reasons to visit Toronto” by Air Canada — Brownman is widely regarded as a vanguard for the evolution of jazz in Canada. This dynamic performer has been chalking up the airmiles in recent years between tours with the award-winning BROWNMAN ELECTRYC TRIO and global guest appearances with luminaries such as Paul Simon, Quincy Jones, Jay-z, Missy Elliot, Pavlo and many others. But all the globe-hopping hasn’t made him forget his passport says Canada on the front! 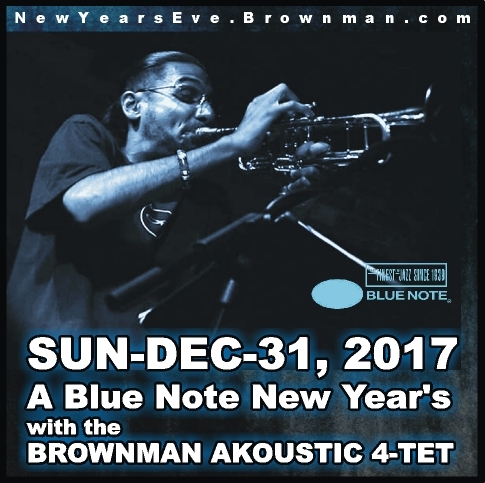 Trane Live Events, Caliban Arts Theatre & Remix Lounge are proud to have one of the country’s jazz iconoclasts — accompanied by an all-star cast of some of Toronto’s hottest top-shelf 20-somethings as side-men — at the helm of a New Year’s Eve party you won’t soon forget!